ANTIGO, WI (WAOW/CNN) – Drones are becoming a popular aid in selling homes and fighting fires, but over the weekend, a drone led the way as hundreds of volunteers searched for a missing 3-year-old boy. The child is home safe. “(The) sheriff’s department called us and we headed out right away first thing in the morning,” Cameron Berg of Unmanned Systems Inc. said. “It was a very valuable resource,” Langlade Co. Sheriff Bill Greening said. As 400 volunteers gathered in Deerbrook in search of missing Dyton Logalbo on Sunday, a tiny aircraft helped organize the search efforts. “(It) helped direct volunteers. (It) helped with the oversight of the entire field we were looking in,” Greening said. Berg said the boy may have been found much sooner, but the equipment he needed, a thermo cam, was at a testing facility in Montana. He said unmanned aircraft could be the law enforcement tool of the future. “A department our size, there’s no way we could afford a helicopter or an airplane for that matter. But yeah, these would be the next best option,” Greening said. In fact, the sheriff’s department already has a plan to go more high tech. Drone technology was used by police and fire officials Thursday to measure whether residential evacuations would be necessary during Thursday’s seven-alarm fire at a Gurnee propane-storage facility. As of late Friday afternoon, fire officials had not released a suspected cause or damage estimate for the blaze at Pinnacle Propane Express. Gurnee Fire Department Lt. David Douglass said it appeared most of the damage occurred to propane tanks and their storage area as opposed to the building where the company’s staff works. “The building is standing,” Douglass said, adding that company staff was at the site Friday, although the business was not operational. Gurnee Mayor Kristi Kovarik said Friday corporate officials from the operation’s business headquarters in Irving, Texas, made the trip to Gurnee to help assess the situation. While the fire was raging Thursday afternoon, Gurnee police used a drone to monitor to measure the temperature of two large propane tanks on the property and determine that evacuation of nearby neighborhood residents was not necessary, according to Gurnee Fire Chief Fred Friedl. Areas in the immediate vicinity of the fire, including some businesses, were evacuated due to the blaze, which broke out at about noon Thursday. Explosions rang out as propane tanks blew up during the fire, one of which was launched from the site and hit the wall of a neighboring business, Kovarik said. The fire at the storage facility, located at 3895 Clearview Court, was serious enough to bring out firefighters from 30 departments and close surrounding roads, including Route 41, for several hours Thursday afternoon. About a dozen employees had safely exited the facility, and nearby businesses were also evacuated. The state Fire Marshal’s Office has not been brought in to the investigation, which is being handled by the Gurnee Fire Department. Investigators were working the scene Friday, Douglass said. “There are no preliminary causes (to announce),” Douglass said Friday. Kovarik said Friday that the storage business was one of the facilities in the village that police, fire and public works officials realized could be a potential danger, and plans were in place to address the fire when it broke out Thursday. “We had identified it as a high-risk business,” she said. Friedl said firefighters used foam on a pile of small propane tanks that ruptured and caused small explosions that added to the fire. The pile of small tanks was near two larger tanks used to refill the cylinders, Friedl added. Route 41 was closed for several hours while the fire was brought under control. Employees were allowed to return to a neighboring business by 4:30 p.m.
Pinnacle Propane Express representatives said they were working with authorities to help determine what caused the fire and reduce the risk of future incidents. They also praised the work of Gurnee responders and those from other departments. HALF MOON BAY, Calif. — From a bluff overlooking the Pacific Ocean, a loud pop signals the catapult launch of a small fixed-wing drone that is designed to carry medical supplies to remote locations almost 40 miles away. The drones are the brainchild of a small group of engineers at a Silicon Valley start-up called Zipline, which plans to begin operating a service with them for the government of Rwanda in July. The fleet of robot planes will initially cover more than half the tiny African nation, creating a highly automated network to shuttle blood and pharmaceuticals to remote locations in hours rather than weeks or months. Rwanda, one of the world’s poorest nations, was ranked 170th by gross domestic product in 2014 by the International Monetary Fund. And so it is striking that the country will be the first, company executives said, to establish a commercial drone delivery network — putting it ahead of places like the United States, where there have been heavily ballyhooed futuristic drone delivery systems promising urban and suburban package delivery from tech giants such as Amazon and Google. That Rwanda is set to become the first country with a drone delivery network illustrates the often uneven nature of the adoption of new technology. In the United States, drones have run into a wall of regulation and conflicting rules. But in Rwanda, the country’s master development plan has placed a priority on the use of the machines, first for medicine and then more broadly for economic development. The new drone system will initially be capable of making 50 to 150 daily deliveries of blood and emergency medicine to Rwanda’s 21 transfusing facilities, mostly in hospitals and clinics in the western half of the nation. The drone system is based on a fleet of 15 small aircraft, each with twin electric motors, a 3.5-pound payload and an almost eight-foot wingspan. The system’s speed makes it possible to maintain a “cold chain” — essentially a temperature-controlled supply chain needed to provide blood and vaccines — which is often not practical to establish in developing countries. The Zipline drones will use GPS receivers to navigate and communicate via the Rwandan cellular network. They will be able to fly in rough weather conditions, enduring winds up to 30 miles per hour. When they reach the hospitals, they will not land but will drop small packages from very low altitudes. The supplies will fall to earth suspended by simple paper parachutes. The planes will then return to a home base, where they will be prepared for a new mission by swapping in a new battery and snapping in a new flight plan stored in a SIM card. 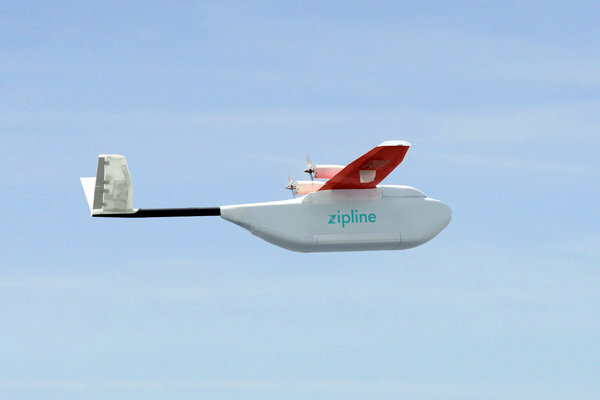 Zipline’s fixed-wing drone. The pilotless planes will be used to deliver medical supplies in a pioneering commercial network. Like Zipline, others are trying to solve the problem of the autonomous distribution of medical supplies. Many other systems being developed, however, are based on less-efficient multicopter or quadcopter designs that have shorter range and less ability to fly in all-weather situations. In the United States, a firm named Flirtey has delivered medical supplies using multirotor helicopters as an experiment in Virginia. Another Silicon Valley start-up, Matternet, is experimenting with the government of Malawi and with Unicef to deliver infant H.I.V. tests by quadcopter. Google X, the advanced research arm of Alphabet, is now developing a vertical-takeoff-and-landing system that will hover and deliver packages by the use of winches. Zipline began in 2014 when two of its founders, Keller Rinaudo and Mr. Hetzler, visited a young public health worker in Dar es Salaam, Tanzania. The worker had created a text-messaging system that enabled hospital workers to urgently request medical supplies in life-or-death situations. But Mr. Rinaudo said he realized that what he was looking at was a long list of death sentences. Today in many places worldwide, attempts are made to deliver medical supplies by motorcycle or pickup truck over roads that are frequently impassable. Mr. Rinaudo and Mr. Hetzler set about to find an airborne alternative to automate a supply chain. They met Keenan Wyrobek, a Stanford-trained roboticist who was instrumental in the design of the PR1 robot, a pioneering general purpose mobile robot with arms, and later the more advanced PR2 robot developed by Willow Garage. The three technologists assembled an engineering team with aerospace industry experience, attracting talent from Space X, Aurora Flight Sciences, Boeing and Lockheed Martin, as well as Stanford and Google. The start-up has raised $18 million from investors including Sequoia Capital, GV (formerly Google Ventures), SV Angel, Subtraction Capital, Stanford University and individuals including Jerry Yang, a founder of Yahoo, and Paul Allen, a founder of Microsoft. Mr. Hetzler said that by placing engineers who have consumer electronics expertise in close collaboration with roboticists and aerospace engineers, it had been possible to rapidly build a highly automated system that would be operated by a staff of five to eight. In February, Zipline signed a contract with the Rwandan government to begin operating the drone service this summer. A small team will be based in a city near the Rwandan capital of Kigali to oversee the service. Deep learning algorithms have taught these aerial robots how to follow an unfamiliar path. Autonomous drones have already mastered the wide-open skies. DHL, Amazon, and Google have each demonstrated self-piloting drones that can deliver packages — in fact, the latter two, as The Verge recently reported, are ready to implement full-scale drone delivery operations in the US and are simply waiting on regulators to get out of the way. But drones that can fly autonomously in complex environments with multiple obstacles (i.e. not the wide-open sky) are another story. Navigation in terrains that are densely populated with obstacles is an ongoing challenge for researchers. There’s been some headway by a team at MIT, who last November demonstrated an autonomous drone avoiding trees while flying at high speeds in a wide-open field. Now, a group of Swiss researchers have developed technology that allows drones to autonomously navigate forest trails, a development they say could one day aid in search-and-rescue operations. In order to train their algorithm, the researchers mounted three GoPro cameras to a headset and took off on hiking trails across the Swiss Alps. One camera was pointed ahead of the hiker, one to the left, and one to the right. After hours spent on these trails, the researchers had snapped over 20,000 images (images in front of the hiker and on either side). Then they used these images to teach their algorithm what the boundaries of a hiking trail should look like. The result was a deep-learning algorithm that allows a drone equipped with a single forward-facing color camera to navigate a previously-unseen trail completely on its own — no human interaction whatsoever. The algorithm, the researchers claim, was even better than humans at determining the correct direction of the trails it traveled on, guessing the correct direction of a trail with 85 percent accuracy. Humans tasked with determining the direction of the same trails were able to do so correctly only 82 percent of the time. The team cautions that these results are still in very preliminary stages. But while there’s a lot more work to be done before autonomous drones will be able to search forests for missing people, the researchers believe their work is a good sign of how deep neural network will allow autonomous vehicles to navigate situations that involve complex and highly dimensional inputs. WANT TO GET AN AMBULANCE THROUGH URBAN ENVIRONMENTS FASTER? GIVE IT PROPELLERS AND SPACE FOR ONE PASSENGER. In emergencies, seconds count. An estimated 1,000 “saveable” lives are lost a year because of slow emergency response in the nation’s biggest cities. But in traffic-jammed urban environments, how can a four-wheeled ambulance be expected to make it anywhere and back quickly? Design firm argodesign has a wild conceptual solution. It’s a one-person ambulance drone modeled after a standard quadcopter—driven by a GPS, pilot, or combination of both—that could be dispatched to an emergency scene with a single EMT. It’s designed to land almost anywhere, thanks to a footprint the size of a compact car. The EMT stabilizes the patient, loads him up, and sends him back to the hospital for further treatment. The idea was born from a team brainstorming session around how health care could become more accessible. The designers first thought about how they could build a better ambulance, and the rise of autonomous vehicles inspired them to consider a self-driving ambulance. Then they thought of helicopters and drones, and the rest developed from there. Assuming you could build it, the drone’s benefits would be significant. A single pilot who would usually fly a single helicopter could manage a whole fleet of drone ambulances remotely, relying on autopilot through the skies, and taking over manual controls only during more complicated takeoffs and landings. There’s also the issue of price: Rolston believes an ultralight drone could be constructed in the million dollar range. That’s several times more expensive than a wheeled ambulance, but still cheaper than a medical helicopter. As wild as the idea may seem, it’s not entirely implausible. Drones exist, they are getting better by the day, and they’re about to take over our skies (some day). Autonomous drivers will be on our streets within the next year. Why not fuse these two ideas? Herding cattle. Counting fish. Taking an animal’s temperature. Applying pesticides. When it comes to drones, “your imagination can go pretty wild in terms of what would be possible,” says Roger Johnson, president of the National Farmers Union. This month, the Federal Aviation Administration issued the first permit for agricultural use of unmanned aerial vehicles. Steven Edgar, president and CEO of ADAVSO, says his Idaho-based business will use a lightweight, fixed-wing drone to survey fields of crops. The first agriculture drones are looking at massive fields of crops to scout out where crops are too wet, too dry, too diseased or too infested with pests. They can help farmers count plants or measure their height. Farmers can now use satellite technology, but it’s slower and less detailed than images from low-flying drone. “This is about getting the most productivity from every square inch of a farm,” says ADAVSO’s Edgar. Alabama farmer Don Glenn said he would buy a drone or use a service that provides drone surveillance on his farm of corn, wheat, soybeans and canola. It’s hard to survey corn fields when they are 8 feet to 10 feet tall, he says. The National Farmers Union’s Johnson says his father used to fly a plane over his ranch and his neighbors’ to spot escaped cattle when he was growing up in North Dakota. That’s something a drone could do with far less money and effort. Lia Reich of the UAV manufacturer PrecisionHawk says the company’s drones can use thermal sensors to take the temperature of cattle. The data comes back as bands of color, and “if all of the cattle look green and one looks dark purple then that one has a higher temperature,” she said. 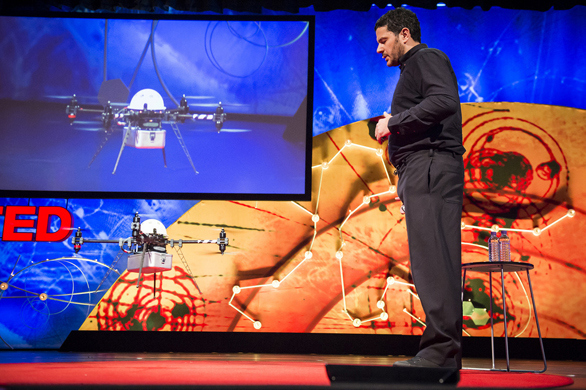 The drones “allow for close-ups and vantage points that satellites and airplanes cannot easily obtain,” Devries says. R.J. Karney of the American Farm Bureau Federation says there is a “major concern” about those kinds of films and his group intends to work with the Obama administration and Congress to address it. He says such films are not only a privacy violation, but can put farmers at a competitive disadvantage. As he went around Napa Valley in the past two years, Ken Giles had the unenviable task of notifying nearby residents that UC Davis would be conducting a demonstration project using drones to spray pesticides at its vineyard in Oakville. Giles, a professor in the university’s biological and agricultural engineering department, said he was prepared for questions, especially given the civil rights qualms over military and police use of drones. “I would go out and say, ‘I’m here to talk on drones spraying pesticides.’ If I was spraying over GMO crops, then I would have been three for three (on paranoia),” Giles wryly noted, referencing concerns over genetically modified organisms. But Giles said he has not experienced much uproar over the program with partner Yamaha Motor Corp. USA, which has used its RMAX helicopter to test the efficiency and safety of aerial spraying over the Oakville vineyard. “It seems to be quieted down a bit,” he said. The drones are expected to be more commonplace in the Napa vineyard, likely by next year if the Federal Aviation Administration approves Yamaha’s application to use unmanned aircraft systems for agricultural purposes. 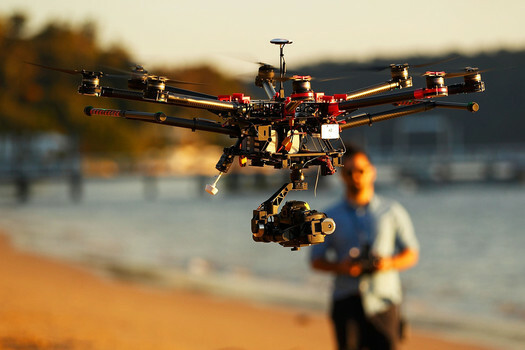 Such approval appears increasingly likely as the FAA on Sept. 25 authorized six aerial photo and video production companies to use drones in the film and television industry. Yamaha and UC Davis conducted a demonstration of the RMAX helicopter on Wednesday in conjunction with the Association for Unmanned Vehicle Systems International, a trade group which supports the defense, civil and commercial sectors. The aircraft, a small helicopter that weighs 140 pounds, carried water in its 2.1-gallon tanks, instead of pesticide. Officials at the event were on message to continually utter the phrase “unmanned aircraft” as opposed to drones, which carry a more sinister meaning. So far, the opposition to commercial use of drones is not as intense as that for military and police use. “Our primary and basically exclusive focus has been and will continue to be on the use of drones by law enforcement,” said Will Matthews, senior communications officer for the ACLU of Northern California, via email. Japan pioneered the use of drones in agriculture during the early 1990s, and now unmanned aircraft farm up to 40 percent of that country’s rice crop. Australia also uses drones for agricultural purposes. Yamaha’s pitch for the American market is simple: the unmanned aircraft can save money, time and be more efficient than the traditional method of spraying by either tractor or by hand. For example, the RMAX, flying approximately three meters above the vines at a speed up to 20 kilometers per hour, can cover up to 12 acres an hour. In contrast, a tractor can cover one acre. “We’re quite a bit faster compared to the current method,” Markofski said. If approved, Yahama would likely target hilly vineyards, such as those along the Mayacmas Mountains, where spraying is much more difficult and time consuming. It also would apply for use in Yamhill County, Ore., which also has many wineries. “Can you imagine treating those (hilly vineyards) with a ground tractor, how narrow those (fields) are and how risky that can be?” Markofski said. The drones also can apply fertilizer and seeds as well as monitor crops. Yamaha would lease the aircraft, operated by a three-man team. The operator must remain up to 150 meters near the drone. 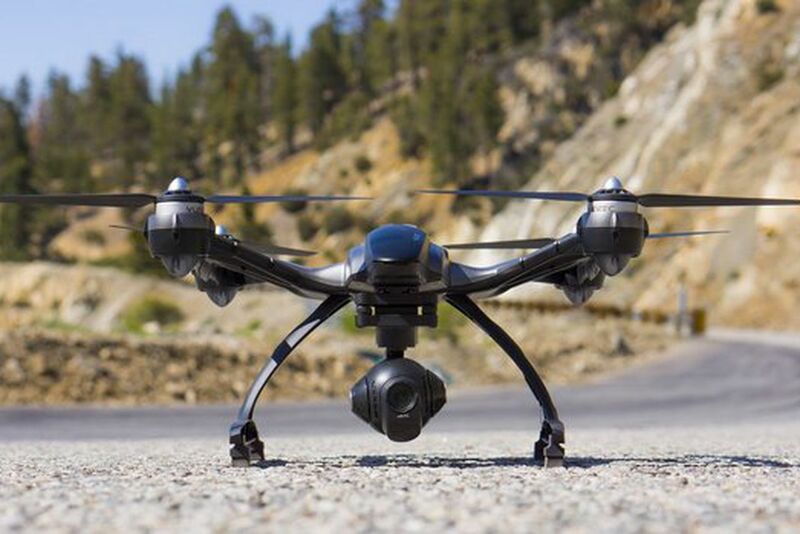 Yamaha is still formulating the price of the drones, pending approval, Markofski said. UC Davis continues to crunch data from the test flights to monitor the drones’ efficiency, productivity and spray drift, Giles said. But so far there have been no red flags, especially in its safety. “It’s a vehicle with potential where we know there are things we can do with it that we couldn’t do in the past — spot treatments, quick treatments, delivery of a very localized payload,” Giles said. Earlier this month, first responders in China used drones to determine the hardest-hit areas following a massive earthquake that killed more than 600 people, in one of the first displays of how drones can be used during emergency situations. One of the great promises of drones is the technology’s inherent ability to be flown above a disaster site, giving first responders a survey of the situation and allowing them to direct where to send aid to. But, until now, that’s been more of a theoretical benefit of drones—very few people have actually used them in the immediate aftermath of a disaster. Take, for instance, the aftermath of Typhoon Haiyan last year in the Philippines: Tons of search and rescue helicopters, but not a single drone, searched for survivors. Well, after an earthquake hit Yunnan, China, earlier this month, rescue workers there called up Hong Kong’s DJI (the largest commercial drone manufacturer in the world), and asked its pilots for help. “We sent a team of pilots to assist the China Association for Disaster and Emergency Response Medicine following the earthquake. This was the first time [the country] used [drones] in its relief efforts and as a result many of the cooperating agencies and bodies working on site have approached us for training / using UAS technology in the future,” Michael Perry, a spokesperson for the company, told me in an email. Perry said that the drones were able to relay images back to rescue workers, who used them to determine which roads needed to be cleared first and which areas of the rubble to search for possible survivors. It’s not clear if the drones directly helped save any lives (and granted, everything we know about the aerial imaging effort in this case is coming from the company itself), but this is clearly the future of disaster relief. Drones are cheap, can be flown close to the ground, and are safer to use than helicopters. It’s only a matter of time until the very first response by first responders is to toss a drone in the air to get a survey of the situation. After that, they just might toss a drone in the air to help deliver medicine and supplies. When Virginia resident Guillermo DeVenecia went missing last Wednesday, police and searchers were dispatched to find the 82-year-old man, who suffers from dementia and hearing loss. For three days, police, search dogs, a helicopter, and hundreds of volunteers combed heavily wooded areas and fields around DeVenecia’s Fitchburg home to no avail. Concerned for his safety as the search dragged on, Fitchburg police issued a news alert to all residents to be on the lookout for the missing man. Lesh usually uses his drone to photograph skiers and snowboarders for his Colorado sports-apparel company, Virtika. Hearing about the missing man, Lesh, his girlfriend, and her father took to the skies on Saturday above a 200-acre soybean field to aid in the search. “I thought what would happen would be we’d be able to give them the peace of mind to cross of some more areas quickly,” Lesh’s girlfriend, Katie Gorman, told local NBC news affiliate WMTV. According to Gorman’s father, Gary, he didn’t think at the time that they’d find DeVenecia alive and safe. “To be honest, when David was flying the drone over the bean fields, we thought we were looking for a body,” he told reporters. Using a FPV, or first-person-view controls, Lesh was able to fly above about 200 feet above the area and view it through the drone’s camera. He canvased the field, which might have taken volunteers many hours, in just a handful of minutes. At the end of the flight around 1 p.m., Lesh said he saw DeVenecia through his camera, standing in the bean rows. “As we were making the last turn to fly it, we noticed a man out in the field sort of stumbling, looking a little disoriented,” Lesh told reporters. Lesh and his group carried DeVenecia out of the field and drove him to the local search command center and his worried wife. “To get a hug from someone’s wife when they’ve been missing, just a tear-filled hug, is a feeling I won’t forget for a long time,” Katie Gorman told reporters. Despite being without food, water, or shelter for three days, DeVenicia was found in good condition, suffering only from some mild dehydration, according to police. Reports indicate that he had no idea he’d been gone that long or that a massive search was underway. Thanks to John Ellenberger over at Cleveland Aerial Media for the link! More forward-thinking farmers are dabbling with small unmanned aerial vehicles (UAVs)—or drones—for a multitude reasons. For Donavon Taves, it all started because of the bears. That’s right—black bears roaming the Louisiana countryside have a tendency to step on or occasionally bite through Taves’ poly pipe irrigation. It was easy enough to fix, but it was time-intensive to check his fields daily for the recurring problem. Taves fitted his small hexacopter (six rotors) with a camera and programmed it to fly over the poly pipe. Each morning, he sits down with a cup of coffee and reviews the footage so he knows which poly pipes to patch before he leaves the house. Problem solved. Taves emphasizes the importance of responsible use, which primarily means don’t fly the drone over your neighbor’s fields. Be mindful of limiting factors such as battery life, which typically is 20 minutes or less. Matt McCrink, a Ph.D. student with The Ohio State University, says that UAVs have numerous other potential uses in production agriculture. Drones can also be used for monitoring and recording plant health, water usage and pesticide dispersal. “This will allow for the creation of a historical database, which farmers might use to project future crop yields and soil health,” McCrink says. Awareness—and scrutiny—for drone technology have grown side by side. Interest has skyrocketed since the Association for Unmanned Vehicle Systems International said that the agriculture industry would be the biggest benefactor of UAV use, says Rory Paul, CEO of Volt Aerial Robotics. “My phone has been ringing off the hook since then,” Paul says. If farmers could use UAVs to capture just 1% more efficient operations or just 1% more yields, “you’re talking about billions of dollars,” he says. But the technology is not without its critics. Most consumers were introduced to drones as weapons of war, not as farm scouting tools. Public outcry varies, but some pockets have generated heated debate about civilian spying and other potential privacy concerns. The citizens of Deer Trail, Colo., will even vote this fall whether the town can issue “drone hunting licenses,” which would allow the townsfolk to shoot down drones and collect $100 bounties for their efforts. There’s also the matter of legality, or possible lack thereof. Most UAV operators follow 1981 Federal Aviation Administration (FAA) guidelines for recreational model planes. Under these guidelines, a UAV can’t fly higher than 400′ and must stay away from airports and other “sensitive” areas such as schools and hospitals. Archaeologists flew a drone over an ancient site called Blue J in northwestern New Mexico to obtain aerial thermal images of the site. Thermal images captured by an small drone allowed archaeologists to peer under the surface of the New Mexican desert floor, revealing never-before-seen structures in an ancient Native American settlement. Called Blue J, this 1,000-year-old village was first identified by archaeologists in the 1970s. It sits about 43 miles (70 kilometers) south of the famed Chaco Canyon site in northwestern New Mexico and contains nearly 60 ancestral Puebloan houses around what was once a large spring. Now, the ruins of Blue J are obscured by vegetation and buried in eroded sandstone blown in from nearby cliffs. The ancient structures have been only partially studied through excavations. Last June, a team of archaeologists flew a small camera-equipped drone over the site to find out what infrared images might reveal under the surface. Casana said his co-author, John Kantner of the University of North Florida, had previously excavated at the site and the drone images showed stone compounds Kantner had already identified and ones that he didn’t know about. For example, the thermal images revealed a dark circle just inside the wall of a plaza area, which could represent wetter, cooler soil filling a kiva, or a huge, underground structure circular that would have been used for public gatherings and ceremonies. Finding a kiva at Blue J would be significant; the site has been considered unusual among its neighbors because it lacks the monumental great houses and subterranean kivas that are the hallmark of Chaco-era Pueblo sites, the authors wrote in the May issue of the Journal of Archaeological Science. The images also could guide archaeologists’ trowels before they ever break ground. “Now that we know what household compounds look like in thermal imaging, we could use it to prospect for structures at other sites,” Casana told Live Science. Archaeological features like bricks and stone walls retain and emit warmth differently than the surrounding soil, meaning heat maps can provide an outline of rubble buried underground. Casana said archaeologists have been talking about using thermal imaging technology to probe ancient sites for decades, but it’s been almost impossible to operationalize. Casana primarily studies archaeology of the Middle East and was leading a dig in Syria until civil war broke out in the country in 2011. In 2012, he got a Start-Up grant from the National Endowment of the Humanities to study aerial thermographic imaging. Casana has been investigating archaeological sites with an eight-rotor CineStar 8 remote-controlled copter, which he built from a $6,000 kit a few years ago. So far, he has tested the technology at a site in Cyprus, a Plains Village settlement in South Dakota and the ancient city of Cahokia near modern-day St. Louis, among others. He said he would be taking the craft to Iraq this summer for a new project in Kurdistan. Archaeologists and other scientists who want to study the Earth from above are increasingly looking at drones as a research tool as the cost for unmanned aerial vehicles, or UAVs, goes down. But the technology is hardly perfect, and there are legal hurdles, too. “People who fly them for fun say it’s not a question of if you’ll crash it, but when and how badly,” Casana said. He found that to be true in his trials. Hardware sometimes comes loose mid-flight and the software on the ground occasionally freezes, Casana said. He travels with replacement parts and backup systems like balloons and kites. Meanwhile, the lack of regulations for UAVs in the United States makes it difficult to implement the technology just yet. The Federal Aviation Administration has set a goal to implement commercial drone regulations by 2015 and recently designated six drone-testing centers across the country to research how UAVs could be safely introduced to U.S. skies. FAA officials have held that it is illegal to fly commercial drones until they write those rules, though they suffered a setback last month when a judge for the National Transportation Safety Board overturned the FAA’s decision to fine a man $10,000 for using a drone to shoot a promotional video, Bloomberg News reported. To comply with these legal gray areas, Casana said he had to rely student volunteers to operate the drone in New Mexico this summer. (“Hobbyists” have no problem flying the aircraft.) He expressed concern that debates about drone use often ignore scientific applications. How Will Drones Change Sports? A couple years ago, Ryan Baker founded Arch Aerial, a Houston-based drone manufacturer. An archaeologist by training, Baker worked on shooting excavations for clients, and eventually moved into working on films. Then, universities and high schools came knocking; they wanted drones to film their athletics. 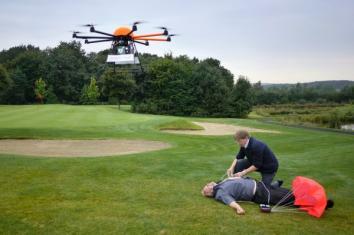 Now, with drones recently shooting sports at the Sochi Olympics, the idea might be gaining some mainstream traction. Baker gave a talk at South By Southwest about how drones are changing sports, and we caught up with him after to chat. Popular Science: Can you start by telling me a little bit about how drones are already being used in sports photography? Ryan Baker: It made the most sense and it was first adopted by extreme sports, because one, the general user in extreme sports, a lot of times they’re younger, and they’re trying to get shots of them skateboarding or skiing or snowboarding. That’s where it’s at now. 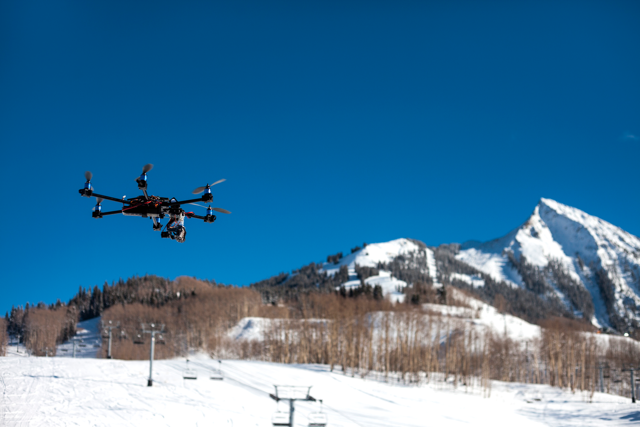 Drones being used at Sochi—that was huge, for our industry in general, because it put it in the public eye. It’s becoming a thing that’s adopted by mainstream sports. RB: Football, initially people think wide game passes, that’s a possibility. But I think it’s more going to be used for practice film and promotional film for teams. Certainly you can get those long shots using those things, but I don’t know if they’ll actually implement that for liability reasons. Contrary to popular wisdom, drones are already among — or above — us. But the drone has already earned its inalterable reputation. Much to the chagrin of the man who uttered the sardonic quote above: the resourceful, loquacious, fingers-in-many-pies Lucien Miller, CEO of Innov8tive Designs, in Vista. Miller is behind his desk in a small office, next to an adjoining warehouse, one of hundreds of manufacturing warrens in the Palomar Business Park. Dressed in a light blue knit shirt, faded jeans, and comfortable loafers, Miller is a-flurry with info and PR on unmanned aerial vehicles and their possibility. Which is why he’s adamant that the word “drone” is a great misnomer. Miller is a licensed pilot whose less than 20/20 vision did not qualify him to fly commercial jets, as he’d hoped to do. To replace it, he’s developed a next-best passion. He designs, builds, flies, distributes, and sells kits and fully assembled aircraft for the radio-controlled model-airplane industry. This technology has, in just three years, evolved into his specialty, the multi-rotor or quadcopter, the hobbyist’s drone. “Instead of having the one big main rotor” like a helicopter, “they have four small rotors with airplane propellers.” His quadcopters, complete at $2000, have “sophisticated GPS systems so when you set them down and power them up they learn the position they took off from.” Auto-command GPS gives them that sense that they “know” where they are because you, the controller, have positioned them so. The ghostcopter in action. Terrifying! Drone strikes in Pakistan — resulting in hundreds of innocent civilians blown apart — have so corrupted Americans’ thinking about drones, Miller notes, that not only does the press ignore the “good uses,” but the consensus remains that all flying things incur surveillance. “It’s all how the media portrays it.” It’s absurd, he says, police peering in our windows with bots. The personal computer and the cellphone did not meet with such bad press. Coverage, for the unmanned aerial vehicles, he finds moronic. So much so that he’s started the rolling blog, thetruthaboutdrones.com. Only positive posts, please. It may be that our deepest fears of a National Security State arrive from outside and above, like in Steven Spielberg’s sadistic War of the Worlds — and not from within our super-hive of laptops and wireless connectivity. Post–Edward Snowden, many privacy rights activists believe the true menace comes from government and corporate surveillance of us via our devices. Still, because of our attack history, we fear the unexpected air assault — 9/11, Pearl Harbor. No wonder we’re spooked by flying machines — those incoming planes are coming for us. Lucien Miller hates the word drones. So does Monica England at Association for Unmanned Vehicle Systems International, the largest unmanned aerial vehicles lobby, which heavily romances both the military and Congress. England writes in an email that unmanned aerial vehicles are not “drones. A drone is a target used by naval aviators in combat training.” She attaches a photo. It’s not a target; it’s a missile, fired from a ship. Headed to Pakistan. Now, that’s a drone. Jordi Muñoz also hates, though good-humoredly, the word drone. The chief technology officer of 3D Robotics, who’s 27, a wunderkind, both affable and brimming with ideas, prefers “flying robots,” he tells me while clearing a desk in his no-longer spacious, research-and-development headquarters in the Kearny Mesa Industrial Park. Floor and shelf space is his number-one burden. He began in his garage, in Riverside, built his first drone at 20, sold it and more at 22, moved to San Diego, where he’s established one of the company’s three sites: a manufacturing plant bubbles along in Tijuana and business and sales are staffed in Berkeley, run by Muñoz’s partner, CEO Chris Anderson, a founding editor of Wired magazine. A drone or unmanned vehicle, he says, can be anything that “makes a decision by itself or follows a preprogrammed mission.” In the air, underwater, inside buildings, searching the wilderness for a lost child — or, the future butler, Droney, as in, “Hey, Droney, slippers, please. The master wants to relax.” Muñoz employs open-source computer codes, taken from Nintendo and the iPhone, to design the “brain” of the unmanned aerial vehicles, also called the machine’s “autopilot.” The brain is a miniaturized panel of sensors that controls the functions of the unmanned aerial vehicles: a lithium-ion battery for an hour or two of flight; an accelerometer for speed; a gyroscope for locating itself in relation to the ground, other flying robots, and unmovable objects (“Look out for that wall, Droney”); and a magnetometer for finding its bearing vis-à-vis north. Muñoz is dedicated to open-source design, in which software codes are shared on the internet for free. “It’s the way I grew up; it’s my mentality,” he says, showing me slides of his PowerPoint presentation. As he developed code for his robots, others used it as well, correcting and revising his language. Though such “online collaboration” remains viable, Muñoz found many hobbyists had no time to make brain and bot as he had. “Do it yourself,” he told them when they inquired if he had one for sale. Instead, they begged for his machines — voilà, 3D Robotics, an international supplier of drones and parts with 170 employees, still growing avalanche-fast. In the past four months, $30 million in new venture capital has fattened the company’s bank account. Already they’re scouting larger digs. There’s been a lot of news about drones this year—and most of it makes the near future sound like a scary place full of heavy government surveillance and aggressive Amazon marketing. But technology isn’t inherently good or bad, it depends how it’s used, and some people are trying to harness the potential of drones to make a positive difference in the world. Imagine that! Here are five initiatives that are working to get some good off the ground. RP SearchServices is the nonprofit division of RP FlightSystems, a company based in Wimberly, Texas, that offers drone data and other aerial data collection services. SearchServices specializes in search and rescue, support for disasters like fires, and environmental data collection. Gene Robinson, who owns RP FlightSystems and runs SearchServices, says that the group has assisted on more than 100 search-and-rescue cases around the country and has made 10 recoveries that were directly attributable to the UAVs. Furthermore, Robinson says that photos his drones took in Tijuana, Mexico, assisted in breaking up a human trafficking ring, and even allowed for the recovery of a pregnant llama. SearchServices is also partnered with the San Diego State University VizCenter, which has an unmanned aerial vehicle division. RP SearchServices often works with search and rescue groups that don’t have required FAA drone certifications so investigations can move forward quickly. To bring defibrillators to remote areas, Height Tech is working on an octocopter system that autonomously delivers defibrillators to people in need. 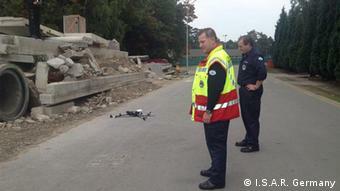 The German company, which also uses drones in movie productions and for surveying, is working with defibrillator manufacturer Schiller and presented the system in August. When prompted, a smartphone app transmits GPS coordinates to the drone so it can find the patient and then drop in a defibrillator by parachute. Currently the Height Tech’s octocopters have a range of about six miles and can fly in all weather at 44 miles per hour, so applications are fairly local for now but could still be faster than an ambulance in rural areas. ConservationDrones.org began in 2011 with a focus on wildlife in Southeast Asia. The founders, conservation ecologist Lian Pin Koh and primate biologist Serge Wich, built their own UAV for about $2,000 and tested it in North Sumatra, Indonesia, for 30 forest and wildlife imaging missions over four days. 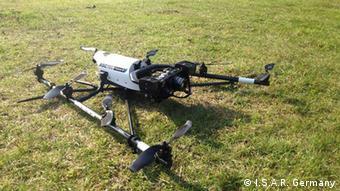 And enthusiasm for the project, specifically using low-cost drones in research, grew from there. In August, Mongabay sponsored the group to become a nonprofit. ConservationDrones.org is currently raising money to do research and conservation work with Mongolian snow leopards in 2014. Alaska’s enormous size and undeveloped land create accessibility issues and make aviation the only option for reaching much of the state. As a result the University of Alaska Fairbanks’s Geophysical Institute started the Alaska Center for Unmanned Aircraft Systems Integration to work on UAV development and research. The group bet that Alaska’s geography would create unusual pressure and demand to implement drone systems for everything from public services to resource management. And they seem to be correct. So far the group has used drones for things like fighting forest fires, mapping glaciers and sea ice, search and rescue, and monitoring marine life. When you hear the word “drone,” you may think of war and surveillance. But as relief efforts in the Philippines after super typhoon “Haiyan” have shown, the unmanned aircraft can also help save lives in times of crisis. Mark Rösen’s greatest pride weighs about two kilograms, can stay in the air for up to 20 minutes and bears the cryptic name “AscTec Falcon 8.” What appears to be a model helicopter is actually a high-tech drone produced by the German company Ascending Technologies and outfitted with eight propellers, a GPS tracking device and a high-resolution camera. Rösen has been working for the German aid agency I.S.A.R. (International Search and Rescue) for many years. He first deployed the drone – which was made available for free by Ascending Technologies – while working as a relief worker in the Philippines. “The drone enabled us to film the area from the air and determine which streets were passable. We no longer needed to send anybody out to scout the area,” Rösen said, adding that the team was relieved by this, as exploring a disaster zone without the help of up-to-date imagery can be very risky and time-consuming. I.S.A.R. Germany specializes in search and rescue operations and is on standby in the case of a building collapse, explosions, earthquakes, floods or storms anywhere in the world. In the Philippines, Rösen’s team was mainly responsible for providing medical assistance to the victims. His organization sent a total of 39 doctors, paramedics and assistants late November to Palo, a city located some ten kilometers south of Tacloban – one of the areas hardest hit by Typhoon Haiyan, aka. Yolanda. Rösen and his team were able to treat more than 2400 people over a period of roughly two weeks. When it comes to saving human lives, every second counts. But official satellite imagery of the affected areas is often not made available on time, according to Rösen. “It can take hours until a satellite is repositioned.” But things are different with the drone, he says. Once airborne, the drone transmits images to a ground station within seconds, and these images are often sharper than the ones provided by satellites, as they were taken from a much shorter distance, Rösen adds. With a 24-megapixel resolution, the pictures are said to be so detailed that one can even identify license plate numbers. In the Philippines, Rösen and his colleagues transferred the areal photographs taken by the drone to a computer and then compared these to images from Google Maps. With the help of coordinates they were then able to assign the operational areas and forward this information to other aid agencies. This allowed the team to make quick decisions as to where the best places to set up field hospitals would be. The images led the team to settle in a square right next to the cathedral of Palo. The mostly undamaged building lies in the center of town and could be easily reached by residents. But quick access to high resolution images is not the only advantage provided by the drone. It also helps elude an autocratic hurdle: “One can deploy the drone without the need to get anyone’s approval. And after a day of training everyone is capable of steering the aircraft,” says Matthias Beldzik, Ascending Technologies’ marketing chief. The manager says the AscTec Falcon 8 is capable of withstanding winds of up to 10 meters per second. However, rain weather limits the drone’s capabilities: “When filmy under heavy rain, the camera lens gets wet, the rotor blades swirl the rain drops even more, thus worsening visibility,” said Rosen. “Our drone carries a thermal imaging camera, which can help us detect people in the rubble who are still alive,” Dawson explained. The drone was also used for tracking down bodies: “There were many corpses floating in the ocean after the typhoon. The drone assisted us in locating them,” Dawson added. While the drones may be useful, these flying helpers come at a high price. With a range of up to eight kilometers, the AscTec Falcon 8 costs about 31,000 USD (23,000 euros) and the Huginn X1- with four propellers and a range of up to ten kilometers – is available for 49,000 USD (36,000 euros). Furthermore, the Huginn X1 fly at over 9849 feet (3,000 meters) and weighs only have as much as the AscTec Falcon 8. 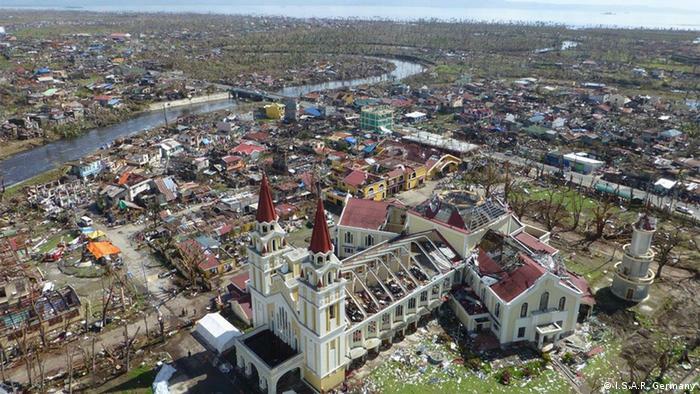 As Direct Relief’s relief and recovery efforts in the Philippines following Typhoon Haiyan continue, civil drones are helping our organization and others respond more efficiently to the most pressing needs of people affected by the super storm. About a week after Typhoon Haiyan struck, an assessment group from Direct Relief’s partner, veterans’ response organization Team Rubicon, sought to determine the operational status of the Carigara District Hospital, located northwest of the city of Tacloban. Travel along damaged roads was difficult and slow. Rumors of an uncertain security situation were circulating. Comprehensive structural assessment seemed highly challenging at best. Yet, the assessment group was able to provide local officials and aid groups with a rapid and highly accurate visual analysis of damage to the Carigara District Hospital – at minimal risk to the people conducting the assessment – by deploying the latest in close proximity aerial imaging technology with a Huginn X1 civil drone. The assessment provided enough information to allow Team Rubicon to proceed with setting up a medical relief station there to help survivors access emergency care. Direct Relief has been supporting Team Rubicon’s medical responders on the ground with critical medicines and supplies. A civil drone is the peacetime and humanitarian cousin of the aerial robotic units which have been discussed extensively in the press throughout several recent US-led military conflicts. The Huginn X1, manufactured by Anthea Technologies and distributed by DanOfficeIT, is a ruggedized quadcopter drone adapted primarily for search and rescue support. It comes equipped with high definition digital cameras as well as thermal imaging to detect the heat signatures of people on the ground who may be in need of help. 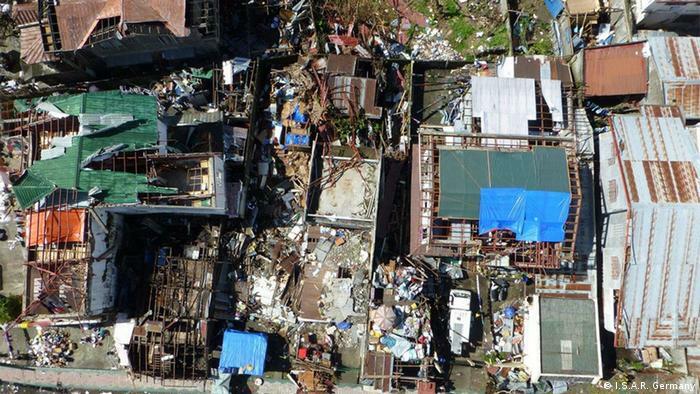 DanOfficeIT contributed the drone technology and manpower free of charge to nongovernmental organizations working on the front lines of the typhoon response to help organizations learn where to focus their work. Civil drones have had an immediate and substantial impact on the ability of groups like Direct Relief and Team Rubicon to gain high-speed visual awareness of complex situations that threaten to put humanitarian responders at significant personal risk. Likewise, civil drones allow for detailed aerial mapping in support of operational planning. The Huginn X1 was not only valuable in terms of structural assessment but also as a way to scout locations in advance to determine the best possible routes of approach and assistance. While policy, procedural, and technical challenges remain, current work in the Philippines foretells a future where humanitarian responders may be able to collaborate closely with advanced robotic tools to improve the speed, accuracy and safety of response efforts.